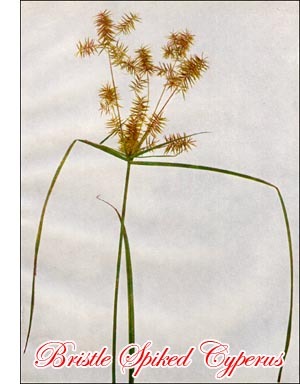 The sedges of this genus have been known under different names, and as "Galingale," "Earth-nuts," and "Bulrushes," many species have served the world since the days of remote antiquity. The far-famed Papyrus of the Nile is a Cyperus whose many uses it is unnecessary to recount, and in Isaiah we note the mention of sedges as we read that "the land shadowing with wings" sent ambassadors, "even in vessels of bulrushes upon the waters." The nut-like tubers of certain sedges of this genus are edible, and the roots of a few species are fragrant and aromatic, yielding agreeable perfumes. Our common species grow in clumps, most frequently in moist places, and bloom during midsummer and later. The stems are leafy at the base and are triangular. The flowers are borne in spikelets which are usually flat and linear and are clustered on branches at the summit of the stems. A conspicuous terminal flowering-head is thus formed, of which a distinguishing feature is the presence of one, several, or many leaves surrounding the base of the flower-cluster.